PFC Robert “Bob” E. Engle was born on 11 Dec 1919. He was the son of William Franklin and Elizabeth McIntyre “Bessie“ Lear of Dauphin County, Pennsylvania. Bob’s father was a Spanish-American War veteran, and worked for the PA Railroad. Bob came from a large family. He had 7 sisters and 3 brothers, and was the seventh child in his family. Besides “Bob”, his nickname was “Cootie”. Bob attended William Penn HS in Harrisburg (now closed) where he was voted most admired student and best male athlete. He was also a member of the Sigma Betta Kappa fraternity (a fraternity whose goals were to promote good fellowship, fine school spirit and outstanding citizenship). After graduating high school, Bob attended Harrisburg Academy where he excelled in sports. This earned him a scholarship to Rhode Island College where he played football. Bob was always very athletic, and besides playing football and running track during his school years, he also loved boxing. Post-grad, he was a Golden Gloves PA State Champion. He also worked at the nearby PA Railroad in Enola. Bob married Virginia Kayes, and they had two daughters, Jeanne and Nancy who were ages 3 and 1 respectively, at the time of his death. 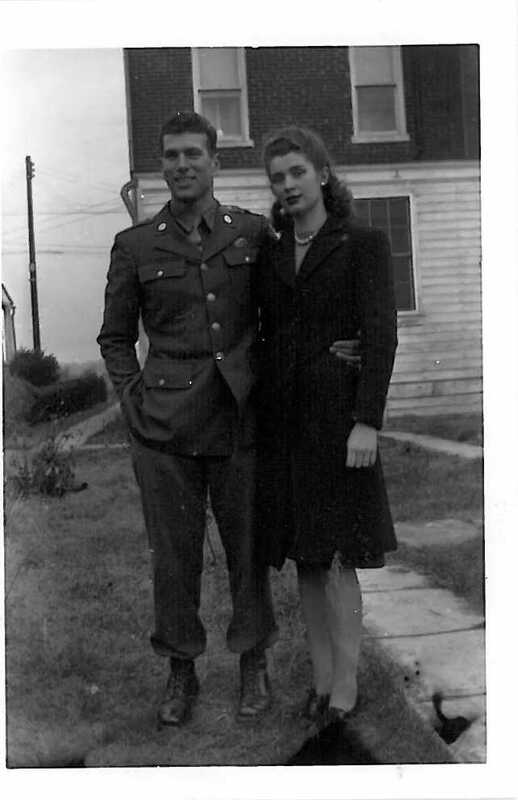 Military career: Bob enlisted on 8 Jan 1943 in Harrisburg, PA. He was assigned to the 377th Parachute Field Artillery connected to the 101st Airborne Division. His athletic abilities served him well when he attended jump school. He had written a note home to his family, which stated that he would soon get his “wings”. Bob sailed for England in September, 1943 to continue training for Operation Overlord. The 377th Parachute Field Artillery Battalion (PFAB) was stationed at Benham Valence near Newbury. During the late winter and spring of 1944, the battalion participated in a series of formal exercises: Exercises Beaver, Tiger and Eagle. As part of the 502d Regimental Combat Team on D-Day, the 377th PFAB was tasked with destroying a German battery of four 122mm howitzers and other installations in the rear of the northern sector of the beach near St. Martin-de-Varreville. The objective was to secure the 101st northern flank. Unfortunately, with the loss of two planeloads and the wide scattering of the remaining battalion sticks, the 377th lost 11 of their 12 75mm pack howitzers. Even though the battalion was unable to assist the 502d in their objective as an artillery unit, most of the artillerymen were able to fight as infantrymen with various groups on D-Day. 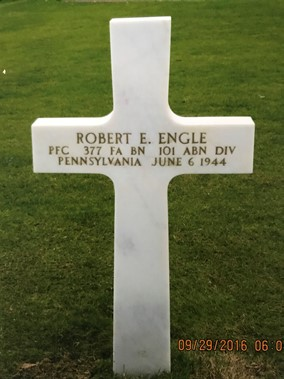 Robert E. Engle, age 24, was killed on D-Day when he was shot down parachuting in to help those on land. He is buried in Normandy American Cemetery, Plot B Row 8 Grave 12, Colleville-sur-Mer, France.